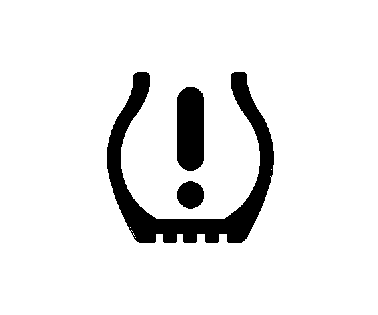 The low tire pressure warning light may come on in cool weather when the vehicle is first started, and then turn off as the vehicle is driven. This could be an early indicator that the air pressure is getting low and must be inflated to the proper pressure. A Tire and Loading Information label shows the size of the original equipment tires and the correct inflation pressure for the tires when they are cold. See Vehicle Load Limits, for an example of the Tire and Loading Information label and its location. Also see Tire Pressure. The TPMS can warn about a low tire pressure condition but it does not replace normal tire maintenance. See Tire Inspection, Tire Rotation and Tires. Tire sealant materials are not all the same. A non-approved tire sealant could damage the TPMS sensors. TPMS sensor damage caused by using an incorrect tire sealant is not covered by the vehicle warranty. Always use only the GM-approved tire sealant available through your dealer or included in the vehicle. One of the road tires has been replaced with the spare tire. The spare tire does not have a TPMS sensor. The malfunction light should go off after the road tire is replaced and the sensor matching process is performed successfully. See "TPMS Sensor Matching Process" later in this section. The TPMS sensor matching process was not done or not completed successfully after rotating the tires. The malfunction light should go off after successfully completing the sensor matching process. See "TPMS Sensor Matching Process" later in this section. One or more TPMS sensors are missing or damaged. The malfunction light should go off when the TPMS sensors are installed and the sensor matching process is performed successfully. See your dealer for service. Replacement tires or wheels do not match the original equipment tires or wheels. Tires and wheels other than those recommended could prevent the TPMS from functioning properly. See Buying New Tires. Operating electronic devices or being near facilities using radio wave frequencies similar to the TPMS could cause the TPMS sensors to malfunction. If the TPMS is not functioning properly, it cannot detect or signal a low tire condition. See your dealer for service if the TPMS malfunction light comes on and stays on. Each TPMS sensor has a unique identification code. The identification code needs to be matched to a new tire/wheel position after rotating the tires or replacing one or more of the TPMS sensors. The TPMS sensor matching process should also be performed after replacing a spare tire with a road tire containing the TPMS sensor. The malfunction light should go off at the next ignition cycle. The sensors are matched to the tire/wheel positions, using a TPMS relearn tool, in the following order: driver side front tire, passenger side front tire, passenger side rear tire, and driver side rear. See your dealer for service or to purchase a relearn tool. There are two minutes to match the first tire/wheel position, and five minutes overall to match all four tire/wheel positions. If it takes longer, the matching process stops and must be restarted. Press the MENU button to display the menu items in the Driver Information Center (DIC). Use the thumbwheel to scroll to the Tire Learn menu item screen. Press and hold the SET/CLR button to begin the sensor matching process. The horn sounds twice to signal the receiver is in relearn mode and the TIRE LEARN message displays on the DIC screen. Place the relearn tool against the tire sidewall, near the valve stem. Then press the button to activate the TPMS sensor. A horn chirp confirms that the sensor identification code has been matched to this tire and wheel position. Proceed to the driver side rear tire, and repeat the procedure in Step 8. The horn sounds two times to indicate the sensor identification code has been matched to the driver side rear tire, and the TPMS sensor matching process is no longer active. The TIRE LEARN message on the DIC display screen goes off. Set all four tires to the recommended air pressure level as indicated on the Tire and Loading Information label.